One of the best plants in the shade garden is a little one that could go unnoticed! It is the Beesia. We learned about this one from our friends at Little Prince of Oregon. Mark joined William in the greenhouse to take a look at the great selection of plants they had. 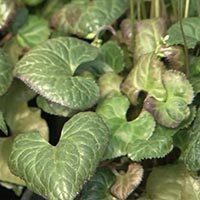 It is a wonderful evergreen groundcover and though this plant may not have a flower that will knock your socks off, it has a glossy foliage that looks fake, it is so shiny. There are small white spikes of flowers, but the foliage is the winner here. In the winter the foliage stays around, but it gets a burgundy edge around the leaves. If you would like to find this plant, check out the Little Prince website for a nursery near you. Succulents are very popular right now. They are easy to grow and easy to care for, and there are so many to choose from! To see some of the newest we stopped by Garden Fever (503-287-3200) to meet nursery owner Lori and our Plant Pick sponsor, Mark from Little Prince of Oregon. First we talked to Lori about the great planters and terrarium bar that they have for customers. Lori showed us the wide selection of rocks, gravel and other decorative elements for building terrariums and planters. 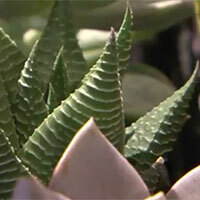 She also told us that succulents work the best in well drained containers and they have a great selection of those too. They also have a great handout on how to build and growing a terrarium, which you can find a link to here! We then moved over to Mark to chat about the plants. Little Prince has a great selection of tender succulents called Plant Poppers. These are great for those smaller containers and terrariums. Mark also recommended a couple of books for interested growers, Succulents by Robin Stockwell, and Terrarium Craft by Kate Bryant and Amy Bryant Aiello. Mark also stressed that these plants love well drained containers and recommended places like Garden Fever who will drill holes in containers if needed so you can be successful. These succulents need a nice bright place indoors during the winter and can be moved outside during the summer, where they can really thrive. If you would like to learn more about these ‘poppers’ you can stop by Garden Fever or you can check out the Little Prince website for a retailer near you. Our ‘Little Prince of Oregon’ plant pick for this week took us to a great little nursery in NW Portland, Pomarius Nursery (503-490-6866). 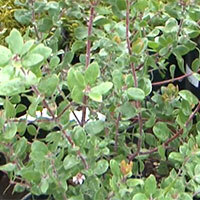 There we found a great selection of Manzanita (arctostaphylos). Pomarius is known for great architectural plants and unique varieties and this plant falls into both categories. Both Wes, a designer at Pomarius, and Mark from Little Prince, told us that this plant is great for many reasons. These are tough evergreen plants and are really drought tolerant when they become established. They also don’t mind poor soils and cold temperatures. They are blooming right now with tiny colorful blooms that will become fruit in early summer. You will find them under the names of arbutus or madrone on some tags, but they are a great plant no matter what you call them! You can find them at most garden centers or wherever Little Prince plants are sold. Website design and content ©2006-2018 Gustin Creative Group. Please send website inquiries to gustingroup@comcast.net. This page last modified June 16, 2018.